We welcome you every day from 14:00 to 22:00. Please note that check-in is possible only at this time. Santa Claus comes to our families,too. That´s why our hotel closed in the period from 23.12. to 27.12. Our reception is open on 31.12. and 01.01. every year from 14:00 to 18:30. Please understand that the estimated price of accommodation shall be paid in full upon arrival. A payment on invoice is basically impossible! For the room reservation throught our website, as well as some booking portals (as booking.com) your credit card is used only for identification. Your credit card will be charged only in case of no-show. From the A 10/E 55 exit Hellersdorf (Möbel Kraft) towards Berlin-Zentrum turn on the B1 after about 10km turn left into Chemnitzer Straße, turn left again after 300m - and you stand in front of our door! You can find a secured and lighted parking right next to our hotel (free of charge). Parking for coaches are also available. 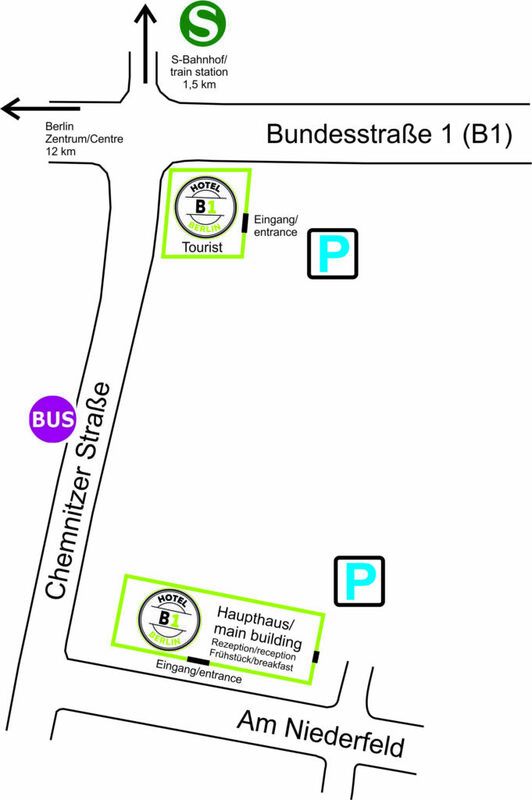 By public transport you can reach us via the S-Bahnstation Kaulsdorf (zone B). From there it is about 15 minute walk or 5 minutes by bus 164 (departing Mo-Fr 4.19am to 23.59pm, Sa 5.24am to 23.59pm, Su 5.34am to 23.59 pm every 20 minutes) to the bus stop Alt-Kaulsdorf/Chemnitzer Straße. In the direction of travel, turn from there please after 100m turn left into the street Am Niederfeld and you are right by the hotel!